The re-Ratify Project | Become a Ratifier! all designed to make teaching the Constitution fun and easy! To gain access to the following packages, log into the system and go to the purchasing page. 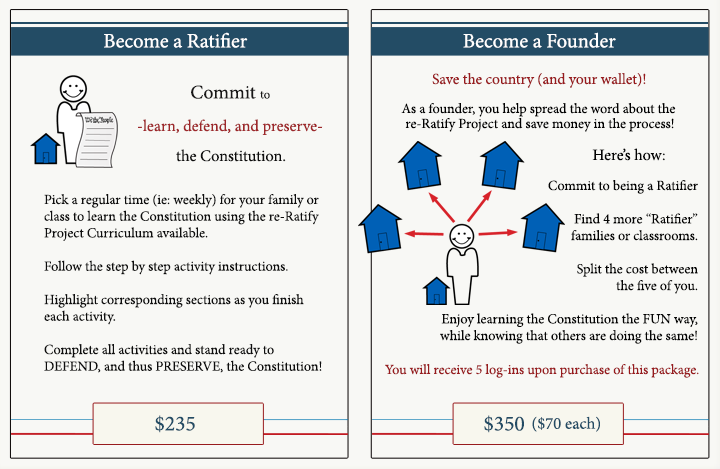 Ratifier Curriculum covers all Articles of the Constitution, drawing material from Convention notes, Federalist Papers, and State ratifying debates. Lessons are addressed to you, the parent or teacher, and contain engaging ideas to help you and your group of Ratifiers retain what you learn through these activities. Just as the Founders had to go out and garner support for the Constitution, we’re asking you to share the re-Ratify Project with others in your circle of influence. To encourage this, we have offered a significant discount on the curriculum for you and your friends via the Founder Package. It’s time for America to re-Ratify the Constitution! Log in and purchase access to the awesomeness today!